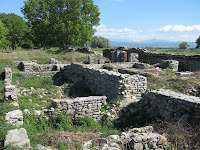 Leaving the mountain city of Gotse Delchev, we look in vain for brown signs for either the ancient Roman city of Nikopolis ad Nestrum or the architectural reserve of Kovachavitsa. Only if chance puts you on the right road, you will eventually be guided towards the first destination. Expect atmosphere but don’t expect Pompeii. In a vast field outside the village of Gurmen, cows graze by the sparse foundations of public buildings erected by the Emperor Trajan to celebrate his victory over the Dacians. Significant lengths of wall indicate the size of the city and it is possible to raise Roman eyes as if from the entrance to the public baths to take in the views of distant mountains circling the plain. You’d better believe it. Yes, that steep track leading off to the right from the main road is the way to the photogenic Rhodop village of Kovachavitsa. A length of corrugated iron fence rusts inexplicably by the first rutted corner. Don’t ask the two boys perched precariously on its top. They could hurt themselves badly in their enthusiasm to guide you. Grip the steering wheel. We are going through a gypsy camp. Fences covered in bright blankets line the road that is full of excited children using any discarded item as a plaything. Amid smoke from fires, lines of washing, shacks, tents, shouting women and mud, old men sit imperviously smoking, waiting for the stew to be served that is now boiling in cauldrons. Ahead an old woman descends from a horse drawn cart. With it she had dragged a wheel-less Trabant into the camp and more children are surrounding it, pulling on its locked doors. Older children mob our car. As we leave the camp they hurl themselves down the slope in an exhilarating game of speed and dodge and swerve. Enjoy this – this the last time we are coming up here. Dancho speaks through gritted teeth as the car judders through a series of potholes, then whines in the wrong gear as the track up the valley gets narrower and steeper. 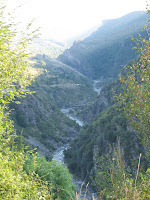 We eventually reach a village that clings to the side of the gorge. Look at the church! It’s a Christian village. The road worsens. To the left cliffs fall sheer to the ribbon of river below. We are still climbing. We enter the next village as if along a narrow corridor. High wooden walls of hay barns hem us in. In front of us a gypsy wagon but there is no place to overtake. Suddenly we hear strident music and ahead we see people lined up in a Horo. Dancho slaps the gear lever. We’ll never get through. The road is the only space in this long ribbon of a village where people can dance and we have arrived at the celebration of a wedding. 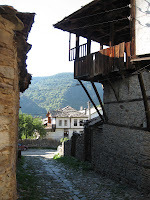 The village is Pomak – inhabited by the Muslim descendants of Bulgarian converts. The women wear headscarves and baggy brightly coloured shalvari. When I slant it on my head like this? Yes, we can now see the gypsy orchestra, blowing up a storm, the bride in all her white finery and seemingly the entire village drawn up in lines, dancing. Annie wants to jump out. Beyond the dance she has spotted stalls selling material and she knows exactly how much to buy for a pair of harem pants. But the smartly dressed guests are prepared for interruptions to their special day and so the dancing stops and we squeeze our way past the gypsy band who continue to play us on our way. Another five kilometers of potholed and rock covered track gets us to our final destination. We wisely park our car just outside the village before entering a Bulgarian Shangri-La. On either side of the street precipitous cobbled paths lead up or down. Buildings cling to the cliffs. If you look through the street window of the apparently single story school house you get a vertiginous view of lines of desks lit by windows two stories below. The houses’ main features are the high wooden verandas that cool the interior rooms and give gossips full opportunity to watch their neighbours. The village has many visitors this holiday afternoon, but walk far enough and you lose everyone. Well not quite – on a corner a young man with glasses is trying to impress his girlfriend. “These houses date from the eighth century!” “Really?” she breathes, believing him. She always wanted to go out with an intellectual. Dancho admits on the way down that the trip has been worth it. And despite his worst fears, the Gurmen gypsy children did not attack the car. They were too busy playing with their new toy – the abandoned Trabant.